For many of us, taking a trip to the Amazonian Rainforest is merely a pipe dream. Not only do you need a lot of pennies, but when it comes down to it the thought of wearing leech socks, smothering yourself in stinky mosquito cream and risking Dengue fever or Malaria can put off all but the most intrepid travellers! However if you’re still yearning for the rainforest we’ve got a great alternative – it’s also a lot closer to home, and you won’t suffer from jet lag. We’re talking about SEA LIFE in central London with its NEW Rainforest Adventure that launched last week, where you can experience all the thrills of the Amazon without travelling too far. Merlin Events hosted a launch event for 200 guests to come and enjoy the new area and venue as a whole. 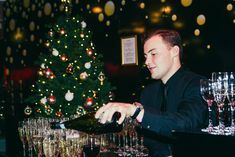 With it’s latest addition, it’s no doubt one of the most interesting and exciting party venues in London and would be perfect for a really unusual Christmas party, or any other type of party! The rainforest tour started with virtual Rainforest Ranger and TV adventurer Andy Torbet, setting guests off on their adventure, inviting them to step deep into a rainforest habitat, and feel the soft floor under their feet whilst breathing in the earthy smells. They had the chance to meet lots of new and exciting creatures – from bird-eating spiders (did you know that The Goliath Bird Eating Tarantula is the world’s heaviest spider? ), to hissing cockroaches, medicinal leaches and two spot assassin bugs (which according to Wikipedia are able to spit venom that can cause temporary blindness in humans!). The brave ones even managed to get up close and personal with a Cooks Tree Boa. Despite having the UK’s biggest collection of Red-Bellied Piranhas no one got their toes nibbled – although their feeding frenzy was pretty spectacular (even if it did bring back memories of Bond’s You Only Live Twice!). The Amazonian explorers at this most unusual of party venues were entranced by the less-threatening terrapins and turtles, and some spotted Bowser the Snapping Turtle (who incidentally was rescued from Richmond Park and adopted by us). Although he looks inquisitive and harmless its worth remembering that he has a very strong jaw action which can easily bite off one of your fingers, so best keep on the right side of him! Some saw the cute pig-nosed turtle – so called because of its unique nose which acts as a snorkel, breathing in water and smelling out food. So what else did we get up to at this most unusual of party venues? Well talking of food, guests were offered delicious South American cuisine to tempt their palates provided by Food by Dish. Everyone was catered for, and we even had a fully Vegan food station (which we can also provide for a private or office Christmas party – or any other time of the year). Those with an appetite for gruesome goodies visited the Dessert Station in Atlantic Cove and tried poisonous mushrooms, flavoured jelly snakes and crocodiles, parrot cake and giant spider chocolates filled with raspberry gel! They enjoyed a full evening of fun South American themed entertainment with face painting, the bug challenge, and a human table with a skirt of Bellinis, saxophonist rounded off by sipping Tequila sunrises as they overlooked the stunning marine life. Of course no visit to SEA LIFE would be complete without the infamous Shark walk, where guests stood centimetres above these majestic predators. Bungle and Zippy may sound cute, but Sand Tiger Sharks have sharp teeth and are voracious feeders of small fish. They also got to see three Nurse Sharks (they’re the ones with funny moustaches) and the jaw-some Black Teeth Reef Sharks. The ocean tunnel enabled them to walk under the sea as shoals of glittering fish passed by before the adventurers took time out to chill with our interactive jellyfish experience. Imagine a Christmas party providing that sort of atmosphere! As the event came to an end, the daring rainforest explorers reflected on their exciting journey and the 50 different species they’d seen ranging from the fearsome, to the weird and wonderful. 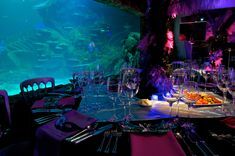 SEA LIFE London Aquarium is a top choice for party venues, for kids birthday parties, an office Christmas party or seated dinners! With the new addition of Rainforest tours, your guests will have plenty to entertain them. If you’d like to host your own event at SEA LIFE or any of our other party venues in London contact events@merlinvenues.com to speak to our team and explore some ideas!